This topic describes how to install and configure the Pivotal Application Service for Windows (PASW) tile. The PASW tile installs Windows cells in your Pivotal Cloud Foundry (PCF) deployment. System Logging: In the System Logging section, if you configure an external syslog aggregator, logs are drained from Windows cells as well as non-Windows cells. See Logging and Metrics for additional information. Disable SSL certificate verification for this environment: In the Networking section, if you select the Disable SSL certificate verification for this environment checkbox, SSL certificate verification is disabled for Windows cells. See Procedure: Terminate SSL/TLS at HAProxy for additional information. Note: Only disable SSL certificate verification for development and testing environments. Do not select Disable SSL certificate verification for this environment for production environments. Download the Pivotal Application Service for Windows product file from the product page of Pivotal Network. From the same Pivotal Network page, download the Windows FS Injector tool for your workstation OS. The Injector tool, winfs-injector, is an executable binary that adds the Windows Server container base image into the product file. This step requires internet access and can take up to 20 minutes. Note: You need the git and tar (BSD) executables on your %PATH% to run the winfs-injector bin. For example, to use winfs-injector.exe, tar.exe must be copied to a directory in your %PATH%. PASW-DOWNLOAD-PATH is the path and filename to the downloaded PASW product file. PASW-IMPORTABLE-PATH is the desired output path for the importable product file. For troubleshooting the winfs-injector, see Missing Local Certificates for Windows File System Injector. Navigate to the Ops Manager Installation Dashboard and click Import a Product. To add PASW to the Import a Product product list, select the importable PASW-IMPORTABLE-PATH file on your workstation. To add PASW to your staging area, click + under the PASW product listing. Click the newly added PASW tile. Click Assign AZs and Networks or Assign Networks. The name of the section varies depending on your IaaS. Assign your AZs and networks and click Save. Specify your selection for Manage Administrator Password. Use the Windows default password randomizes the admin password. With this selection, the admin password is not retrievable by an operator. This is the default selection. Set the password sets the same admin password for every Windows cell. As a result, this password can be used to access any Windows cell, including, for example, Remote Desktop Protocol (RDP) sessions. (Optional) Select the BETA: Enable BOSH-native SSH support on all VMs checkbox to start the Microsoft beta port of the OpenSSH daemon on port 22 on all VMs. Users can SSH onto Windows VMs with the bosh ssh command, and enter a CMD terminal as an admin user. They can then run powershell.exe to start a PowerShell session. Note: This feature is beta and not considered production-ready. (Optional) If you want all VMs to support connection through Remote Desktop Protocol (RDP), click Enable Remote Desktop Protocol. 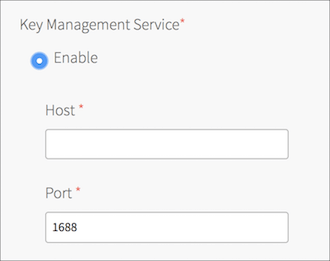 For the Host field, enter the KMS hostname. For the Port field, enter the port number. The default port number is 1688. (Optional) To deploy your PASW application workloads to an isolation segment, click Application Containers and perform the steps in the Assign a Tile to an Isolation Segment section below. (Optional) To configure Windows cells to send Windows Event logs to an external syslog server, click System Logging and perform the steps in the Send Cell Logs to a Syslog Server section. Enter the total desired amount of Diego cell memory in the Cell Memory Capacity (MB) field. For the current cell memory capacity settings, see the Windows Diego cell row on the Resource Config pane. 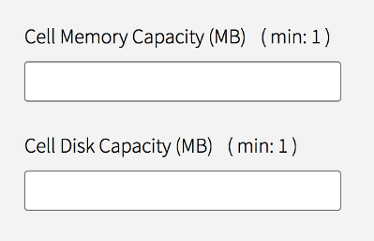 Enter the total desired amount of Diego cell disk capacity in the Cell Disk Capacity (MB) field. For the current cell disk capacity settings, see the Windows Diego cell row on the Resource Config pane. Note: Due to the risk of app failure and the deployment-specific nature of disk and memory use, Pivotal has no recommendation about how much, if any, memory or disk space to overcommit. Click Errands. 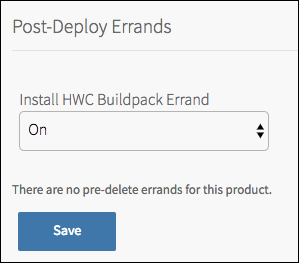 Pivotal recommends that you set the Install HWC Buildpack Errand to On. This ensures that you receive the most up-to-date HWC Buildpack. Navigate to the Resource Config pane of the PASW tile. Use the dropdown menus to configure Windows Diego Cell. For more information, see Disk Size of Windows Diego Cells. Note: Provision your Master Compilation Job with at least 100 GB of disk space. Note: If you use vSphere, you must create your own stemcell. The default root disk size of Windows stemcells v1803.2 and later in the 1803 line is 30 GB. Pivotal recommends setting the root disk size of your Windows stemcell for vSphere to 30 GB. For more information, see Creating a vSphere Windows Stemcell. Retrieve the stemcell that you downloaded or created in Downloading or Creating a Windows Stemcell. 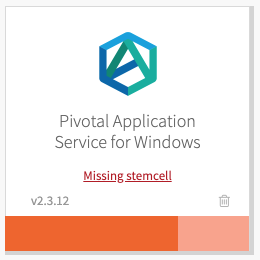 Follow the steps in Importing and Managing Stemcells to upload the Windows stemcell to Pivotal Application Service for Windows. Return to the Ops Manager Installation Dashboard. Select the PASW tile and review the changes. For more information, see Reviewing Pending Product Changes. Click Apply Changes to install the PASW tile. To run Windows cells in multiple isolation segments, you must create and configure additional PASW tiles. For more information, see Windows Cells in Isolation Segments.